The LemonBest 24 LED aquarium lamp is one of my favorite aquarium lights to use in small aquariums. The price is exceedingly low while the value provided is top notch. The LemonBest is my go to light for small refugiums and nano tanks. The low cost allows me to spend more on filtration and circulation while still being enough to get the job done. This doesn’t mean that the light barely scrapes by however. After some careful adjusting my nano tank is bathed in light allowing my plants to flourish. When illuminated with live plants my fish are always happy. In tall tanks the light will coat the entire tank with a warm light. The problem lies with long tanks. Realistically I would only suggest this light for 5 gallon or smaller tanks if it is the primary light source. If you have an unusually long tank you may need a second aquarium light or to look for a light strip. Now to talk about one of my favorite uses of this light. As many people know our children absolutely love Neon Tetra. More specially the love to see glowing fish under a blue light. 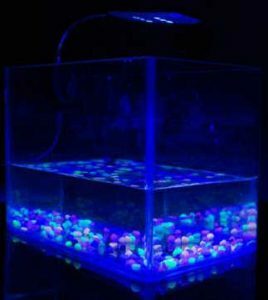 It just so happens that the LemonBest light features a fairly strong blue light that will outshine many “glowfish lights”. With the usually glowfish lights costing over $20-30 I am happy to pay a little more than a third of that for this light. The kids even get to have fun adjusting the light to ‘interrogate’ the fish. Focusing on the adjustable neck we can see some of the lights values and flaws. While the neck does allow us to position the light wherever we want this will often produce a spotlight effect. It is for this reason the light is suggested mostly for small tanks. I have seen multiple lights used in longer tanks, however at that price it makes more sense to buy a longer light strip. Next on the list is the power cord. This tends to run a bit short for most aquariums as the light is located on the top of the tank. Most of my aquariums have their power source elevated to encourage a drip loop so the cord will still work. 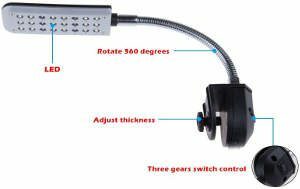 If your tank is located fairly high without any means of extending the cord you may need to look for a different light. At under $15 I cannot justify buying an extension cord. The durability of this light really surprised me. As cheap lights go you can usually expect them to die after a few months, yet my 1st light is still running strong above my sump. The light provided has not faded either as the Macro algae continues to flourish. The same can be said for the Neon Tetra tank, but they are only just over 1 year old. Still quite the lifetime for such a low cost aquarium light. To talk about the biggest problem with this light we move on over to the clip. While this is meant to secure the light onto the fish tank it is so small that the clip does not fit onto most tanks. This can be solved by setting something behind the aquarium or bending the clip to fit your tank. Personally I do the latter and it fits well enough and does not look sloppy. Overall The LemonBest 24 LED aquarium light provides tremendous value at a low cost. The lights do not fade easily and the use of LED bulbs keep power use to a minimum. The power is enough to grow live plants and some low light corals and is best suited to tanks under 5 gallons in size. The clip is a bit of a hassle to use but it’s a quick one time problem for a real bargain of an aquarium light. This entry was posted in Equipment, Lighting on May 13, 2018 by Joshua@themandaringarden.